equipment allows us to provide our clients with high-quality products faster and less-expensively than our competition. be proud of them, too. (Running both Mac OS X and 9). Acuprint uses the Prinergy System, Preps Imposition software and employs the latest staccato (stochastic) printing technology. We accept all forms of media including zip, cd-rom, ftp, and email. 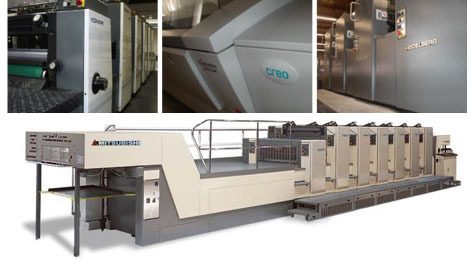 Mitsubishi Diamond 3000 Six (6) Color Plus Coater 40" x 28"
Komori Lithron Five (5) Color Plus Coater	20" x 28"
Heidelberg Four (4) Color Perfecting Press	20" x 26"
Ryobi Two (2) Color	14" x 20"
Ryobi (2) One (1) Color	14" x 20"
Heidelberg	Automatic Cylinder Die Cutter	21" x 31.5"
Heidelberg	Automatic Cylinder Die Cutter	21" x 24"
Heidelberg	Emboss Die Cutter	10" x 15"
Thompson	Hand-Fed Die Cutter	28" x 41"
Stahl	Folder w/ Right Angle	25"